Oakland Raiders wide receiver Michael Crabtree and running back Marshawn Lynch are staying put for at least the 2018-19 season, per The Athletic’s Vic Tafur and NFL’s Ian Rapoport earlier this week. Financial constraints and rumored contributions to dysfunction behind the scenes this past season put both Lynch’s and Crabtree’s future with the Raiders in question early in the offseason, with some sources hinting that the pair’s production wasn’t worth the added headaches. Rumors aside, understanding the degree of their production and overall offensive impact fits right into PFF’s wheelhouse and is vital to seeing just where these two can aid the Raiders in 2018. 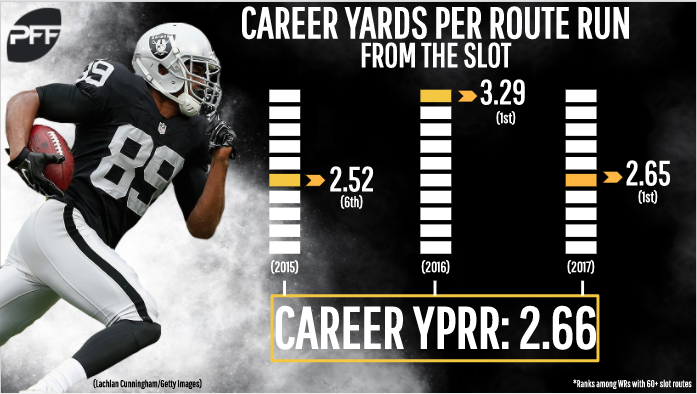 Spending his last three NFL seasons in Oakland, Crabtree has been cast as an afterthought, a supporting actor to the early success of former first-round pick Amari Cooper despite Crabtree’s consistent production. 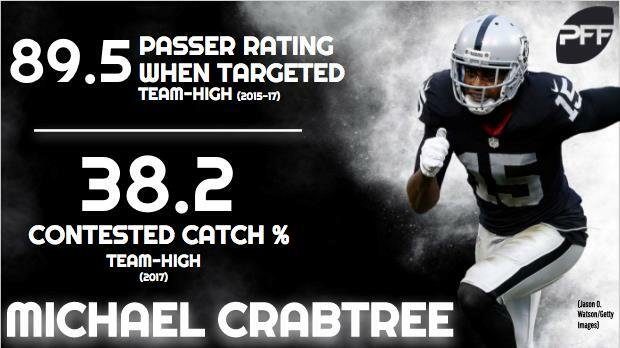 Crabtree has led all Raiders wide receivers with 200-plus targets from 2015-17 (Cooper, Seth Roberts) in catch percentage (57.2), passer rating when targeted (89.5) and percentage of passes caught for a first down or touchdown (34.4). Crabtree has also had a knack for putting together his best performances in crunch time, often coming up big for the Derek Carr and the Raiders’ offense in the fourth quarter and overtime. Ranking seventh among NFL pass-catchers in total fourth quarter/overtime targets with 113, Crabtree has caught 69 passes for 859 yards and nine touchdowns, which outpaced all other Raiders pass-catchers by a significant margin. He also led the team in total first down and touchdown receptions with 45, easily topping Cooper’s mark at 29. Diving deeper into what was a down year across the board for Oakland offensively in 2017, Crabtree earned the highest overall grade among Raiders wide receivers with at least 300 offensive snaps, besting Cooper by a whopping 19.5 grade points. He also led the team’s pass-catchers in contested catch percentage at 38.2 percent, which ranked 36th among the 54 NFL pass-catchers with 20-plus contested targets. Conversely, Cooper ranked second-to-last at 20.0 percent. Perhaps the most desirable aspect of his game, Crabtree has had an overwhelmingly positive impact on the scoreboard, recording a team-high 25 touchdowns over the past three seasons – seven more than Cooper’s 18. Crabtree’s hard-nosed, physical approach to the wide receiver position has helped him carve out a strong career in contested situations, as previously mentioned, and in the red zone. Most recently, he led the team with 25 red-zone targets and 18 end-zone targets, while no other Raiders pass-catcher had more than 18 and nine, respectively. No one is arguing that the soon-to-be 32-year-old Lynch’s prime has come and gone, but if his 2017 performance is any indication, old age hasn’t made him any less deserving of his “Beast Mode” nickname. 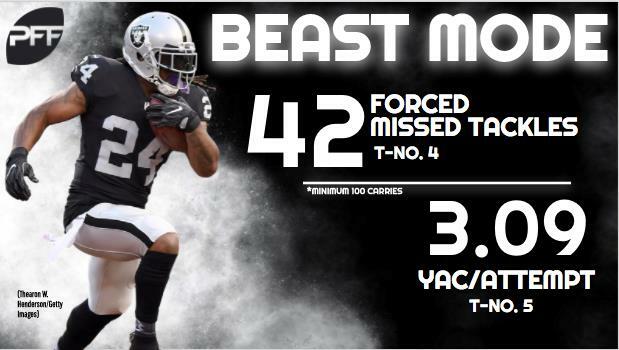 In typical Beast Mode fashion, Lynch bullied his opposition with his hard-hitting running style, to the tune of 891 rushing yards on 207 carries (4.3 yards per carry) in 2017, and he often did so with little push from his offensive line. Among running backs with at least 100 attempts last season, Lynch ranked tied for fifth in forced missed tackles on the ground (42) and tied for fourth in yards after contact per attempt (3.09), and he was part of an offense that ranked 21st in yards gained before contact per attempt at 1.42. In fact, despite being contacted at or behind the line of scrimmage on 47.3 percent of his carries, he averaged 1.76 yards per carry on such runs, which ranked third among qualifying running backs. While Lynch may have struggled catching passes out of the backfield, as evidenced by his 0.83 yards per route run in 2017, he did exceed expectations in pass protection and allowed zero total pressures on his 37 pass-blocking snaps. Also, Oakland already has options behind Lynch in DeAndre Washington and Jalen Richard to fill the offense’s need for production in the passing game out of the backfield. Keeping Crabtree in the fold, of course, means Carr will have his tried-and-true target in critical situations and the red zone in 2018. However, perhaps more importantly, Crabtree’s presence in the offense will allow Gruden to be more creative with who he aims to be the “focal point” of the offense in Cooper. After back-to-back 1,000-yard seasons to start his career, Cooper fell into a bit of a slump in 2017, leading to a meager 48 receptions and 680 receiving yards in 14 games. What could feed into a bounce-back season for Cooper in 2018 is an increase in slot snaps, a transition made nearly impossible if Crabtree were to depart given Oakland’s lack of depth at the wide receiver position. Among the 83 wide receivers with 250-plus routes run from an inside alignment from 2015-17, Cooper ranks No. 1 in yards per route run at 2.66, totaling 61 receptions, 773 yards and seven touchdowns on 291 slot routes in his career. Also, in Cooper’s final year with Alabama in 2014, then Crimson tide offensive coordinator Lane Kiffin lined him up in the slot just 66 times and watched him torch defenses for 443 yards (6.71 YPRR) and four touchdowns on just 19 catches. Lynch’s return prevents Oakland from having to partake in two risky endeavors this offseason: Spending significant cap space on a veteran back in free agency and/or spending high-draft capital at the running back position. McKenzie and Gruden are limited in what they can spend this offseason, and with pressing holes nearly across the board defensively, their money may be better spent elsewhere than the running back position. Lynch is due just under $6 million in 2018, but if the Raiders were to target a feature back capable of a similar impact (Le’Veon Bell, Dion Lewis), they may be spending just as much if not more in 2018 and, in turn, be tied to a longer deal. As for the draft, keeping Lynch will allow McKenzie to start looking at running backs late Day 2 or Day 3 for a compliment to Beast Mode rather than much higher for his replacement.